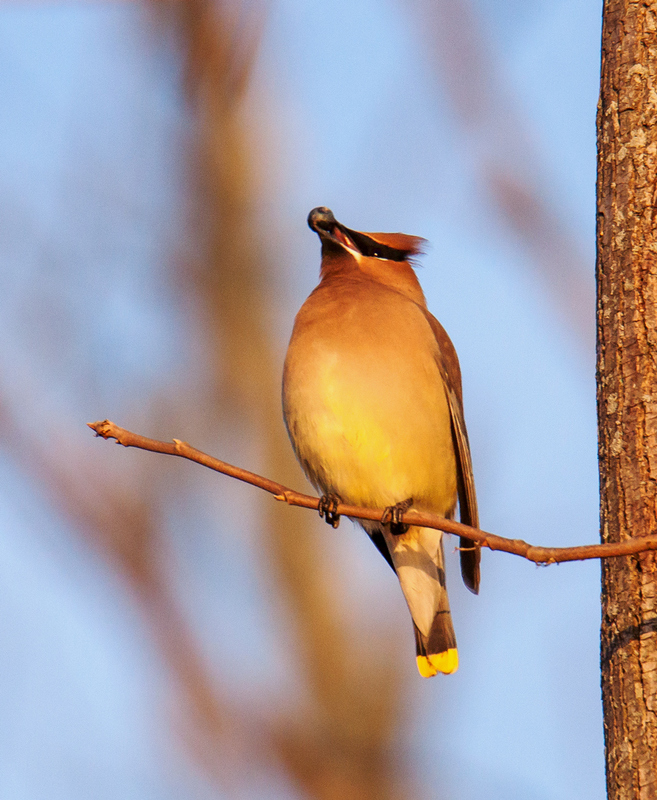 A small flock of Cedar Waxwings (Bombycilla cedrorum) was active last week at Occoquan Bay National Wildlife Refuge. They stayed high in the trees, but I did manage to get this shot of one of these distinctive and very cool-looking birds as they foraged among the plentiful berries. 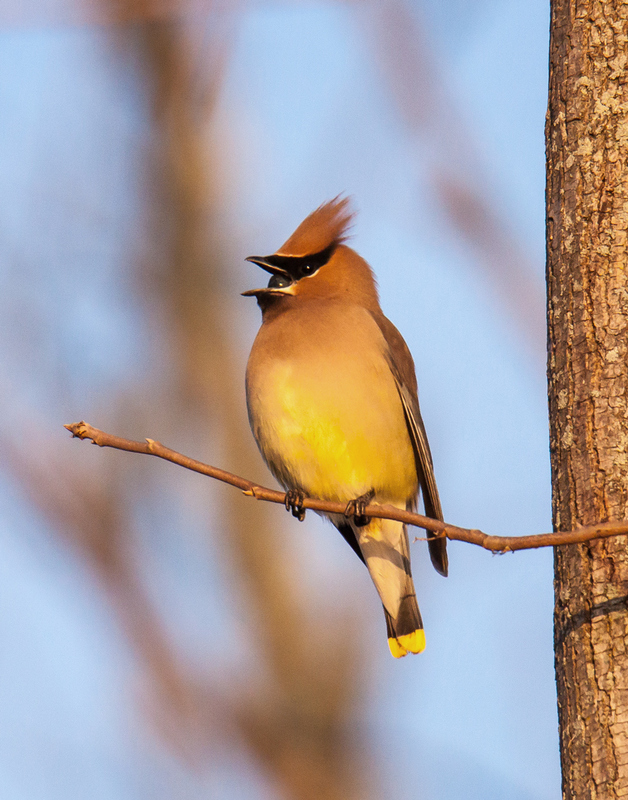 It was pretty cool yesterday morning to see a small flock of Cedar Waxwings (Bombycilla cedrorum) foraging at Occoquan Bay National Wildlife Refuge. One of them was using gravity to help it ingest a berry that it had managed to found. 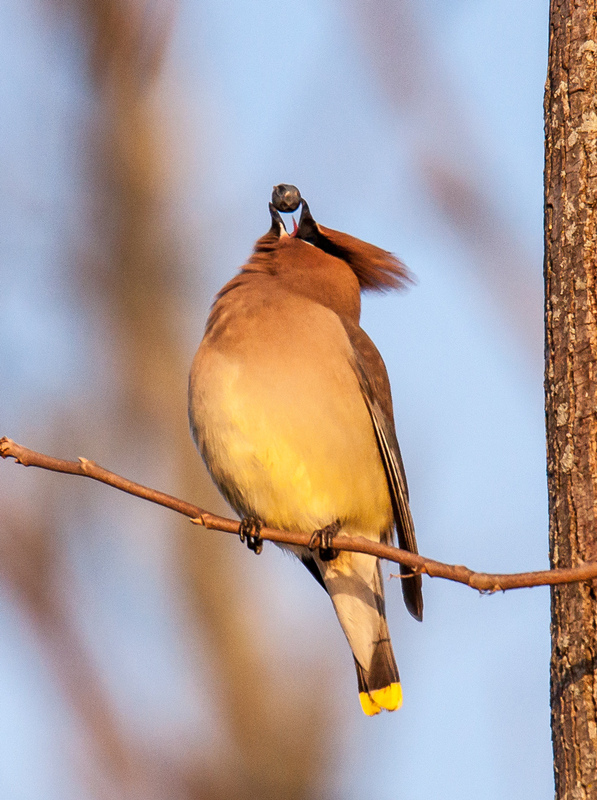 If you look closely, you can see what appears to be the bird’s tongue. It seemed to take a bit of effort, adjusting ever so slightly the head and mouth, but eventually the beautiful little bird was able to get the whole berry into its mouth. In many ways, it was similar to watching a Great Blue Heron swallow a fish, albeit on a greatly reduced scale. 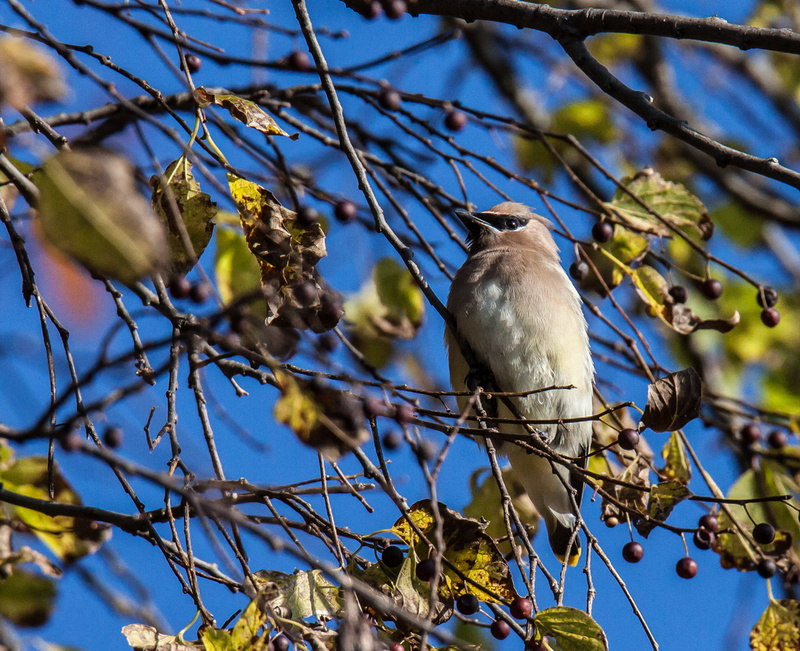 As I was trekking about at Huntley Meadows Park on Saturday, I was thrilled to spot this Cedar Waxwing (Bombycilla cedrorum), a species that don’t see very often at the park. Normally when I do see one, it is buried in the branches or is far away, but this bird posed for a moment on a branch and I was able to get an unobstructed shot of it. 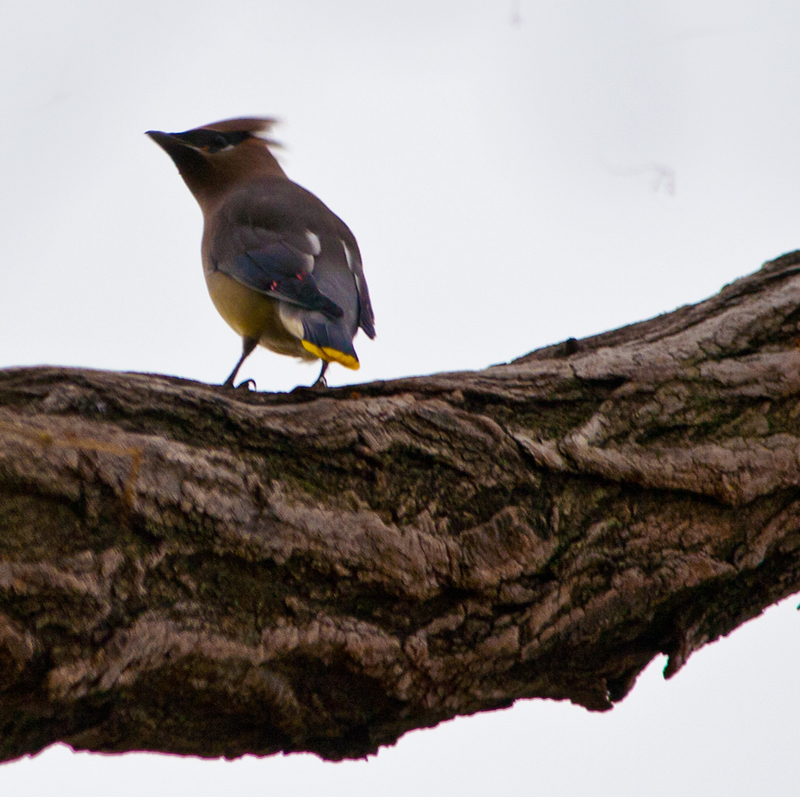 The Cedar Waxwing was in the shade, but its silhouette is unmistakable and I could identify it immediately. Today was cloudy, windy, and overcast—definitely not an ideal day for taking photos. Sure, I like to have some clouds to cut down on harsh shadows, but you need sunlight to have shadows, and we sure did not have much of that today. This afternoon I was walking on a path along a creek when small flock of birds flew into some nearby trees. They were pretty noisy and that attracted my attention. Looking though my telephoto zoom lens, I saw that they had an interesting silhouette, so I took some shots. They sky was already really light, but when I tweaked the exposure a little it went totally white and a really cool-looking bird emerged from the shadows. 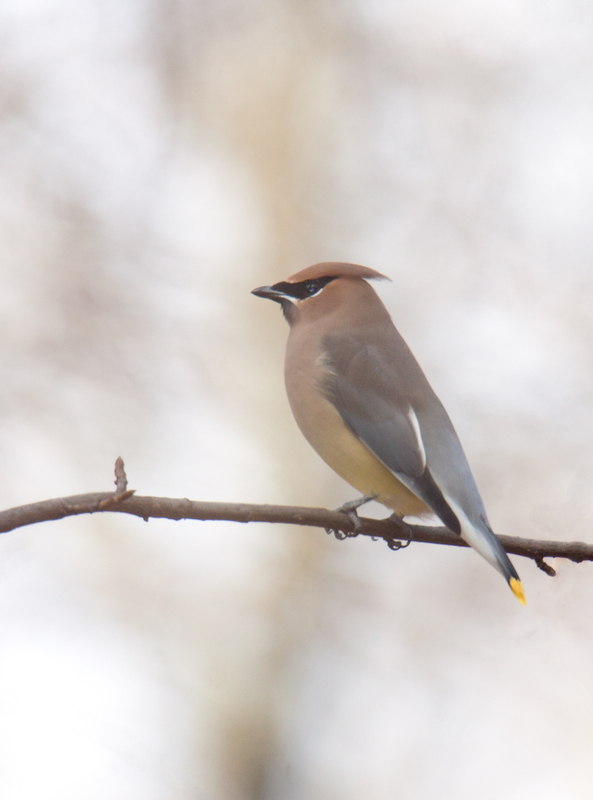 Usually I am pretty bad at identifying birds, but my initial Google search on the very distinctive yellow wing tips was successful in identifying this bird as a Cedar Waxwing (Bombycilla cedrorum). 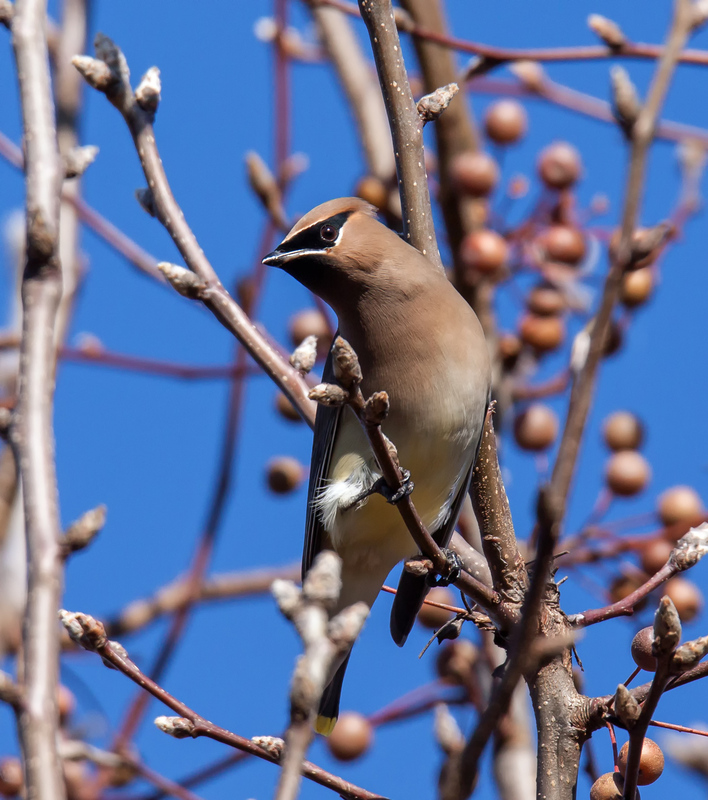 According to the Cornell Lab of Ornithology, Cedar Waxwings feed on mostly fruit year-round, one of the few North American birds that specialize in eating fruit. One of the consequences of doing so, however, is that they sometimes get intoxicated from eating fermenting berries. The range map for this species suggests that they may be present year-round in this area (we are close to the northern boundary), but this is the first time that I have seen one. This photo is more “artsy” than realistic, but I like its graphic character. It looks a bit to me like an illustration, in part, I guess, because of the white background.